This years Advent calendar is almost a complete opposite of last years where I used a chalkboard as the background. A new house and a white stone fireplace was my starting point. While my kids may appreciate the look, it’s the little presents that get them talking and waiting in anticipation of December 1st. I was honored to see my calendar at Marianne Simon Design and Marin Mama Cooks. I’m using many of the items I used last year, but with touches of red and pink. I’ll be filling my candy jars with treats and will be making more wreaths…lots more…from all the greenery in our yard. I love adding a few new things every year and mixing it with the old things from family and friends over the years. Have you started your holiday decorating? Red & Pink together with greenery is a stunning look!! Your lovely advent display on the hearth almost looks southwest! Glowing …so warm! My new addition this year is a Charlie Brown tree that I bought at Elawa Farm Christmas Market yesterday! I thought sugar cookies with red ribbons would be fun, and then my family reminded me that Cooper our dog would eat them all 🙁 Thinking of a new idea?? oh this is so pretty annie. love it all, esp that stone fireplace! wow. maybe show us a tutuorial on wreath making. i’d like to make mine this year too! No decorating yet but lots of baking and candy making! 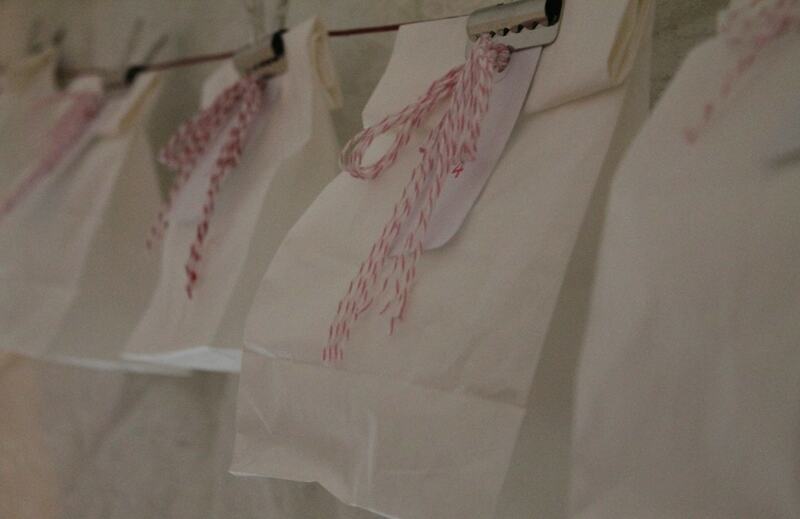 Love the look of white on white with a touch of red thrown in… Bet your kids love December 1st as much as ours do! Annie! I love everything that you design. You are so darn talented and have such amazing ideas. I wanted to let you know that I’m writing a brief paragraph about you in my weekly menu post tomorrow. I going to link over to your 2 advent calendars as well as your holiday gift tag idea. I think they are all marvelous ideas and I want to share them with my friends! I wish I had the time and talent to do what you do. If you lived closer to me, I would hire you out in a nanosecond. Ok, have a lovely day girl! It looks really great! I am in full swing over here, although I keep finding myself drawn to coming up with new little crafty things instead of getting the lights up outside and the tree decorated. Love your advent calendar! Your fireplace is so cute, especially with the pillows. Did you paint it white? It reminds me a lot of ours, which was brick not stone, but had a shelf above like yours. I painted the whole thing. Your address pots are adorable too! Going to try those! Love everything here. Lot’s of great ideas! you seriously know how to rock the advent calendar. It must look so cute as the count down begins! Annie I want to move in with you, everything you do is so so beautiful, you really do elevate life in simple ways everyday, Janet ( gardeners cottage) does that too. It looks so pretty! Charming, serene … And some lucky kiddos! Annie, I love all your glassy babies. Your home looks so comfortable. Enjoy the holidays in your new home. Annie, it couldn’t be more charming! Decor from nature is my favorite and you certainly have a knack for using it! Annie it looks great! 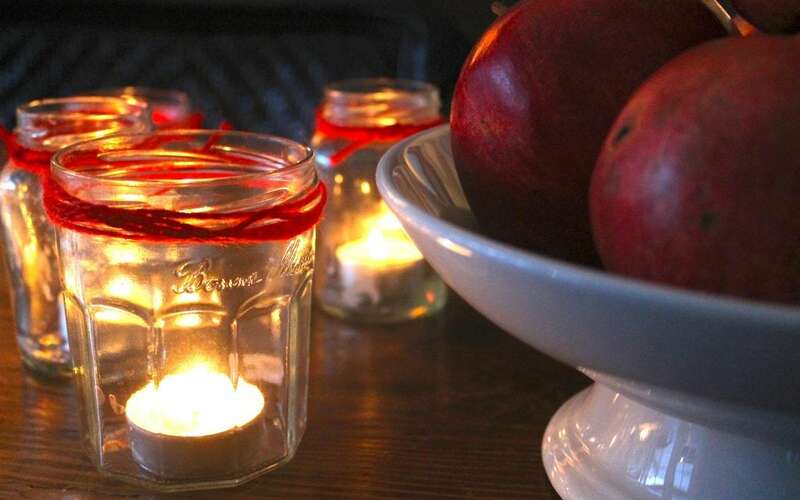 I love how you keep it simple and yet so festive at the same time….that is quite a talent! 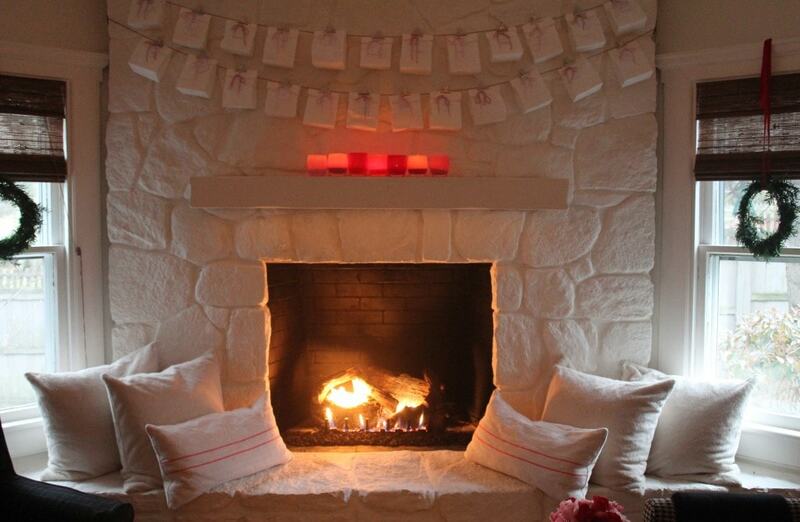 As a lover of white, your advent, fireplace, hearth, pillows etc are just perfect. I am settled in my new apartment and ready to decorate for Christmas….thanks for providing much needed inspiration! I raced through the pictures, my mind is a blur of beautiful images. Going back to inspect more slowly……what a fireplace and OMG those pillows. I’m crocheting garlands for the tree. This years’ tree I’m hoping. Well, Lady, you’ve done it again. This scene is the very definition of simple cozy and Christmas-y. Pure loveliness. The pillows are so quiet and beautiful. You never cease to amaze me … such talent and creativity and fabulous photographs too. Beautiful job Annie! Your fireplace is beautiful Annie and I think this may be my favorite Advent calendar that I’ve seen so far this year. It’s simple yet so pretty at the same time. Great job and what a cozy space you’ve created. I loved your advent calendar last year and this one is equally beautiful! Don’t think I have seen your fireplace yet and it is gorgeous! This is a must pin!